The lymphatic system is a network of vessels that transports nutrients to the cells and collects their waste products. The lymph system consists of lymph capillaries and lymph vessels that are somewhat similar to blood capillaries and blood vessels. In addition, it includes lymph ducts (tubes that carry fluids secreted by glands) and lymph nodes (reservoirs that filter out bacteria and other toxins from the lymph that passes through them). In the circulatory system, blood flows from the heart, through the arteries, and into capillaries that surround all cells. When blood reaches the capillaries, a portion of blood plasma (the liquid portion of the blood) seeps out of the capillaries and into the space surrounding cells. That plasma is then known as tissue fluid. Tissue fluid consists of water plus dissolved molecules that are small enough to fit through the small openings in capillaries. Tissue fluid is an important component of any living animal. Nutrients pass out of tissue fluid into cells and, conversely, waste products from cells are dumped back into the tissue fluid. Some tissue fluid returns to blood capillaries by osmosis. (Osmosis is the process by which fluids and substances dissolved in them pass through a membrane until all substances involved reach a balance.) But some tissue fluid is also diverted into a second network of tubes: the lymphatic vessels. Tissue fluid that enters this network is known as lymph. Lymph is a clear, colorless, somewhat sticky liquid. The liquid formed in a blister is lymph. Capillaries: Tiny vessels in the body that carry fluids such as lymph and blood. Lymph: A fluid that runs through the lymphatic vessels, lymph nodes, and other lymphatic organs. Lymphocyte: A cell that functions as part of the lymphatic and immune systems by attacking specific invading substances. Lymph node: Region of lymphoid tissue along lymph vessels that filters harmful antigens from the blood and some tissues. Osmosis: Process in which fluids and substances dissolved in liquids pass through a membrane until all substances involved reach a balance. Tissue fluid passes out of the space between cells and through the walls of lymph capillaries. Now called lymph, it follows a pathway back to the heart that is somewhat similar to the venous system for blood. It passes from lymph capillaries into larger tubes, the lymph vessels. Like veins in the blood circulatory system, lymph vessels have valves that help push lymph slowly back towards the heart. Eventually the lymph enters a large collecting tube, the thoracic duct, located near the heart. From the thoracic duct the lymph empties into the blood circulatory system itself at the left subclavian vein. The lymph system performs a second function also. Fats that have been absorbed in the small intestine enter lymph vessels in that organ. Those fats are then carried through the lymphatic system back into the blood circulatory system. 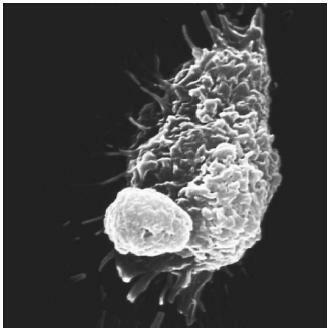 in a variety of forms known as T cells (T lymphocytes) and B cells (B lymphocytes). Third, lymph nodes are home to very large blood cells known as macrophages. Macrophages attack and kill bacteria by surrounding them, swallowing them up, and then dissolving them with enzymes. Fourth, lymph nodes produce antibodies that are used to fight infections. Lymph nodes are located in the armpit, neck, and groin. One symptom of an infection is that lymph nodes become swollen with harmful material and can be seen or felt. The uncontrolled growth of cells and tissues of the lymphatic system result in a condition known as lymphoma, or lymph cancer. Lymphomas are classified into two types, Hodgkin's or non-Hodgkin's. Both forms can be fatal. Hodgkin's lymphoma, or Hodgkin's disease, is marked by enlargement of lymph nodes, usually those in the neck. Symptoms of Hodgkin's include chronic fatigue, depressed immune function, weight loss, night sweats, and pain after drinking alcohol. Hodgkin's lymphoma can be treated successfully and cured with radiation or chemotherapy if it is caught in its early stages. Although the cause of Hodgkin's is unknown, males, Caucasians, people of higher socioeconomic status, the well-educated, and people with certain blood types are more prone to develop it. For unknown reasons, Hodgkin's most commonly affects people in their twenties or seventies. People who work with certain chemicals, such as benzene and rubber products, also seem to be more prone to develop the disease. Several forms of non-Hodgkin's lymphoma have been identified. These forms have little in common with each other. One example of a non-Hodgkin's lymphoma is Burkitt's lymphoma, prevalent among Central African children. Burkitt's lymphoma is characterized by enlargement of the lymph nodes under the jaw. In contrast with most lymphomas whose causes are unclear, Burkitt's lymphoma has been linked to infection with the Epstein-Barr virus. Symptoms for most lymphomas are similar. Many patients experience enlargement of the liver and spleen as well as the lymph nodes. Some patients have bloody stools or vomit blood. Tiredness, itching, weight loss, fever, and general failure of the immune system may also be present. These symptoms may diminish and intensify over several months before a diagnosis is made. Sometimes, a bone marrow biopsy (test) is also performed. Treatment includes radiation or chemotherapy. Effectiveness of such treatments varies depending on the severity of the lymphoma at the time of diagnosis. Bone marrow transplants have been effective against some lymphomas in advanced stages. The cure rate for non-Hodgkin's lymphomas is generally poorer than for Hodgkin's lymphomas. What is the difference between lymph and tissue fluid? Have developed lymphatic condition of left foot and ankle, which cauases fuild build up in lower part of leg. I might add that the foot has been operated on three times and ended with amputation of all my toes. I take diaretics for fuild problems anyway, but due to swelling on end of my foot, the surgical wound will not close. I currently use a compression stocking with silver as well perform treatments with inflatable system three time a day. My question if any alternative medications can be used, or is this going to be a ongoing condition the rest of my life. A Physician stated that the possible cause was from trama to the foot from repeated operations? Any suggestions would be healpful, as this disrupts my normal life. My son has multiple swelling. Its seems to have started in the jaw, then that went away, then it is in his armpit, and that seems to have disappeared, and now its in the center of his chest plate. His groin nodes hurt as well. He sweats at night, is fatigued and very pale. He has an upset stomach too. This has been going on for over 3 months. I'm seriously worried it seems to travel in a path like pattern of swelling nodes. Has anyone heard of this? How do particles in the lymph get excreted from the body? Eg. inhaled particles that reach the thoracic duct from the lungs?